PhenixID Pocket Pass comes with branding capabilities. This will describe enabling this feature. 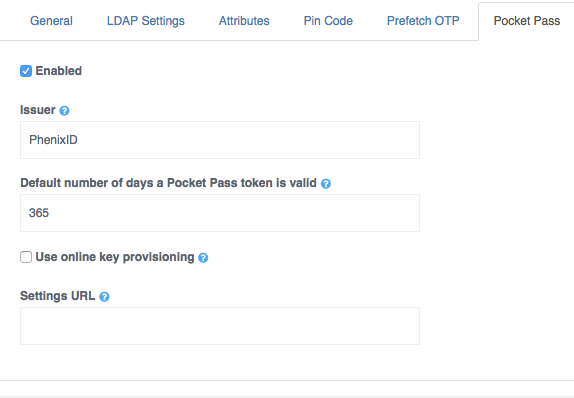 Configure by entering the URL to the Pocket Pass settings file. Note that this URL must be reachable by Pocket Pass clients at time of activation. The settings file is in json format. Images must be exactly the size specified below, and in jpeg or png format. Jpeg is probably the best choice due to its smaller size. The format of all colors must be #aarrggbb. The aa (alpha-value) of the color is preferably set to ff. The background image used in portrait mode. The image size must be 720x1280 pixels. The background image used in landscape mode. The image size must be 1280x720 pixels. The color of the one-time password text. The color of the one-time password text shadow. The color of the one-time password time bar (When using time-based one-time passwords). The background color of the one-time password time bar. The color of the one-time password button text (When using counter-based one-time passwords). The background color of the one-time password button text.